The football season was ending already at steps 3 & 4 and tonight saw the playoff semi finals. 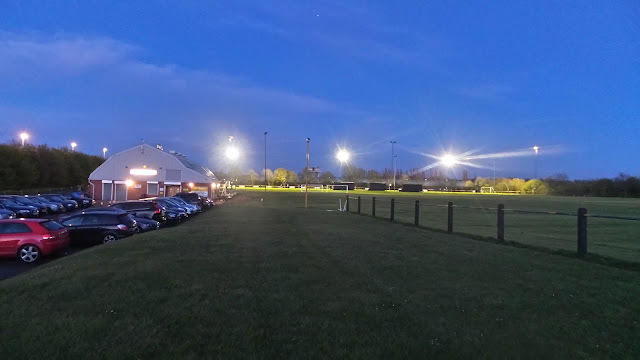 Initially I fancied Taunton Town in the Southern League D1 South & West, but it was a bit of a long journey when I had to be up at 4 in the morning. I'd have Anwar back in the passenger seat after a series of excuses and other commitments so I text him for his opinion. 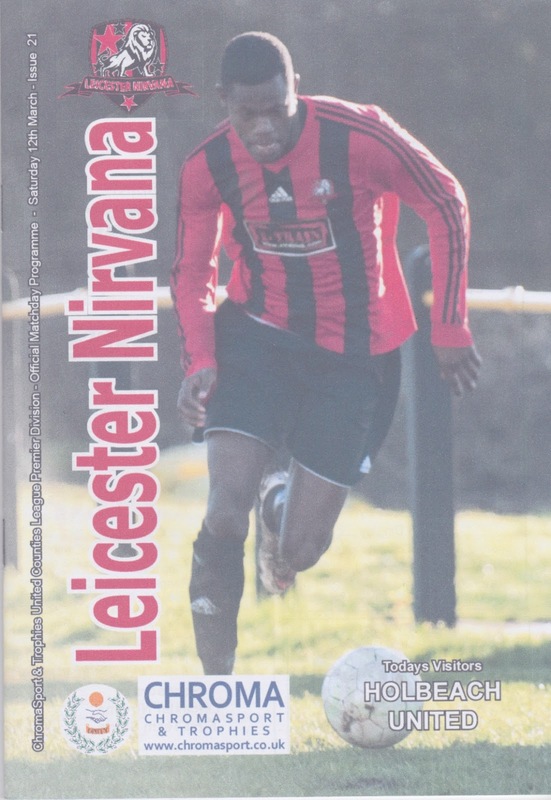 He gave his preference as Leicester Nirvana & Rothwell Corinthians and with the latter more likely to feature on this August's UCL & PDFL groundhop, I selected the brilliantly named Nirvana as this weeks hop. Research found a Piri Piri chicken place within a short drive of the ground, so that was dinner all sorted. 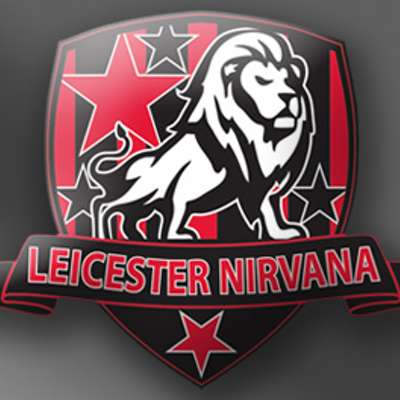 LEICESTER NIRVANA were formed in 2008 as a result of Thurnby Rangers (long time members of the Leicestershire Senior League) and Leicester Nirvana (an initially junior team who spent a season in the Central Midlands League, finishing as runners-up in their first season. 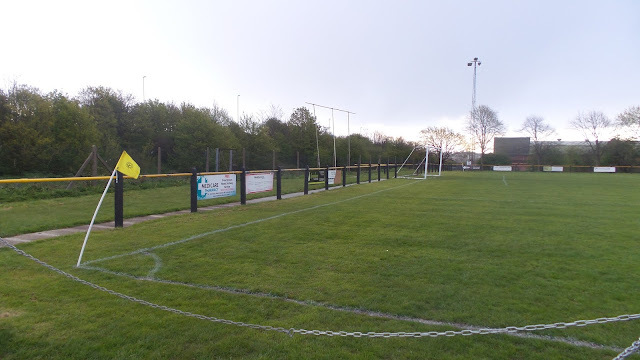 They were initially known as Thurnby Nirvana upon merger but changed back to one of the clubs original names last summer. 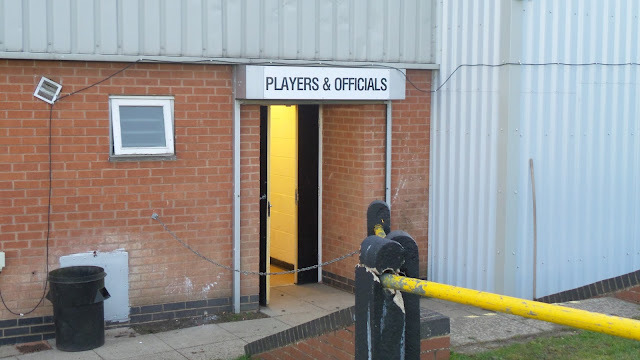 Initially taking up Thurnby Rangers place in the Leicestershire Senior League, a 3rd placed finish in their debut season was enough to see them admitted to the East Midlands Counties League as Thurmaston Town & Leicester Constabulary, the teams who finished above them, chose not to accept promotion. 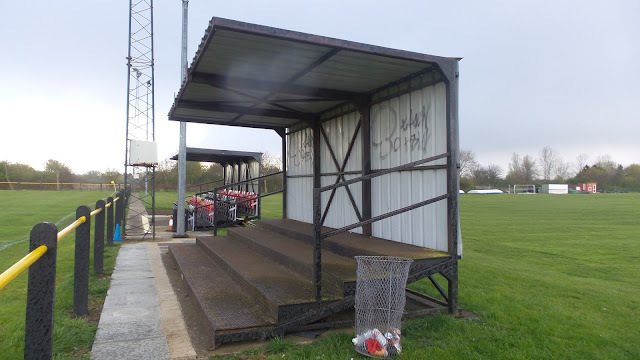 After finishing 9th in their first season of 2010/11, they gradually progressed up the league and by 2014 they were champions, winning promotion to the United Counties Premier. 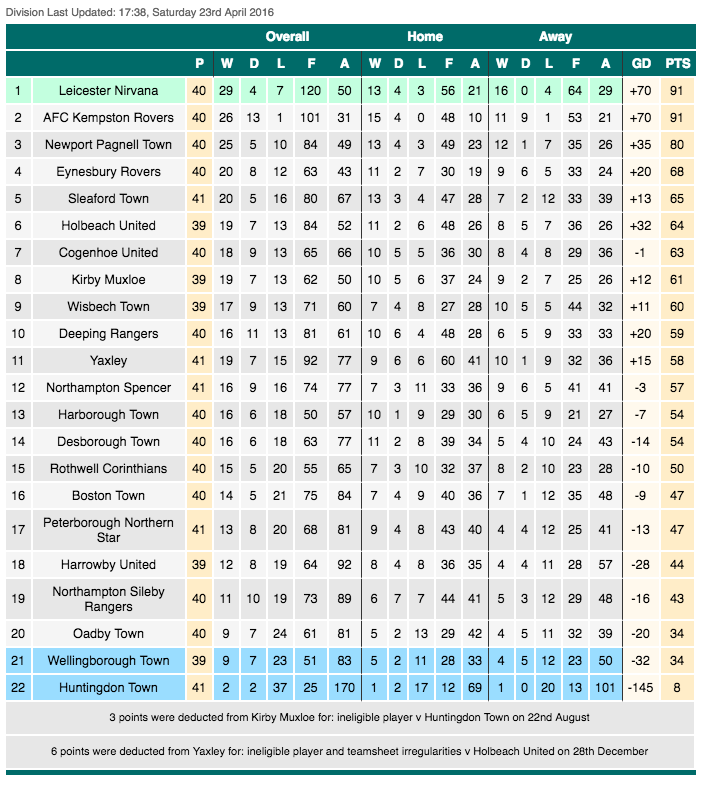 Last season they finished as runners-up, and they have carried that on this season with them being in a very tight title race with AFC Kempston Rovers with just goal difference splitting the 2 sides. 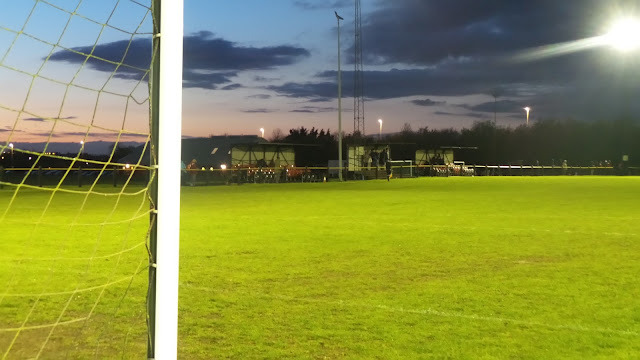 Both sides were on long unbeaten runs and were facing tough games tonight - 6th placed Holbeach United were the opponents tonight while Kempston faced 4th placed Eynesbury Rovers. IN the FA Cup the clubs' best run came in their debut season of 2011/12. 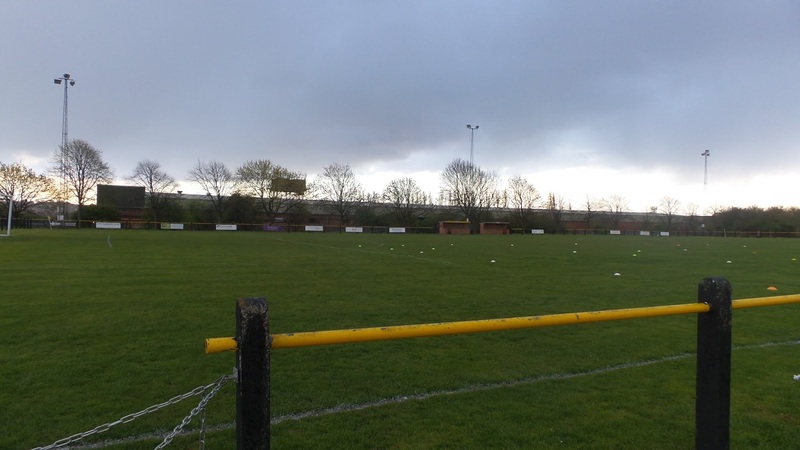 Desborough Town & St Neots Town were beaten before a defeat to Barrow Town in a 1st Qualifying Round replay. The FA Vase 4th Round has been reached in the past 2 seasons, though this year's game was one to forget as they crashed 6-0 to finalists Hereford in a game that was delayed due to the bad weather.The club also won the East Midlands Counties League Cup in 2011. 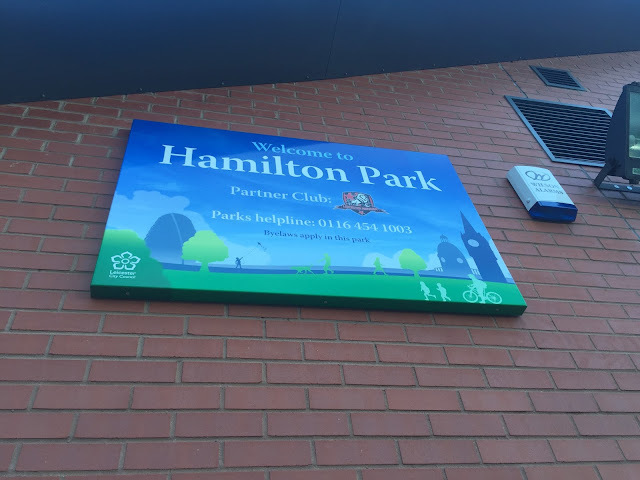 It was usual day off work and walk down town on the day of the game, and as I was coming back I listened to the verdict of the Hillsborough Disaster court case where the authorities were found liable for the death of 96 innocent football fans. It’s an absolute disgrace that lies, cover ups and erroneous reporting has meant that it has taken over 27 years for the families of those who lost their lives to get justice, but hopefully the victims can now truly rest in peace. I spent the afternoon listing a few bits on eBay, having spent quite a lot lately I needed the money. 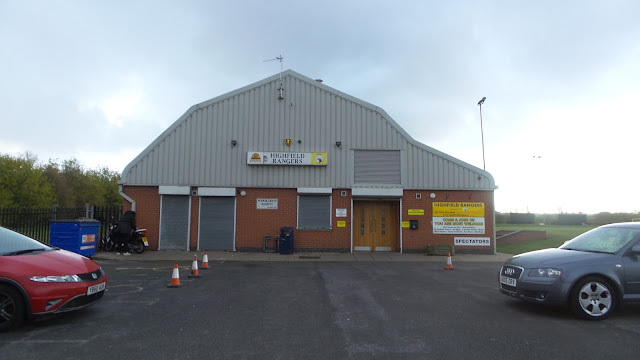 I left at 3.30, getting to Aylesbury to meet Anwar at 4.15. That was after there was an accident on the A413 near the Chiltern Hospital which resulted in a diversion through Great Missenden and a 20 minute delay. It looked a nasty one so the closure was probably justified. Luckily though it appears as if everyone survived without serious injury. It was also slow getting out of Aylesbury and then again through Milton Keynes as it was rush hour. After all this I was surprised that the M1 was generally good with just the 50MPH limit through the roadworks holding us up. The biggest delay probably came getting off the M1 into Leicester due to poorly designed traffic lights that only stayed green for a few seconds. Eventually we got to Peri-Zza, our pre match meal place at 6.30 where I had a half Peri Peri chicken meal for £4.99. 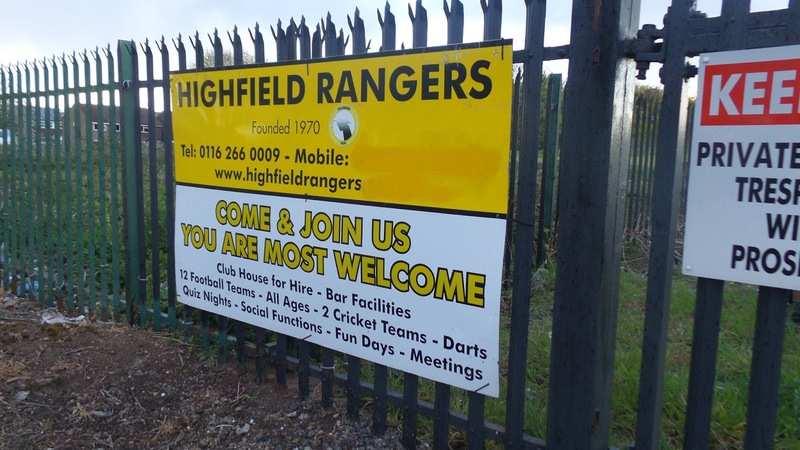 It was excellent and amongst the best meals I have had whilst groundhopping though I wish I'd opted for the whole chicken option. From there it was onto the ground though we went to the junior ground and club offices first as that was the address given on the official website. That was just a field and building and was deserted so it obviously wasn't there. We guessed that the groundshare with Highfield Rangers that was mentioned on Wikipedia still existed do we headed off there and luckily there was more life there. I paid £5 entry plus £1 for a decent programme, albeit from the time of the original date for this fixture on 12th March. 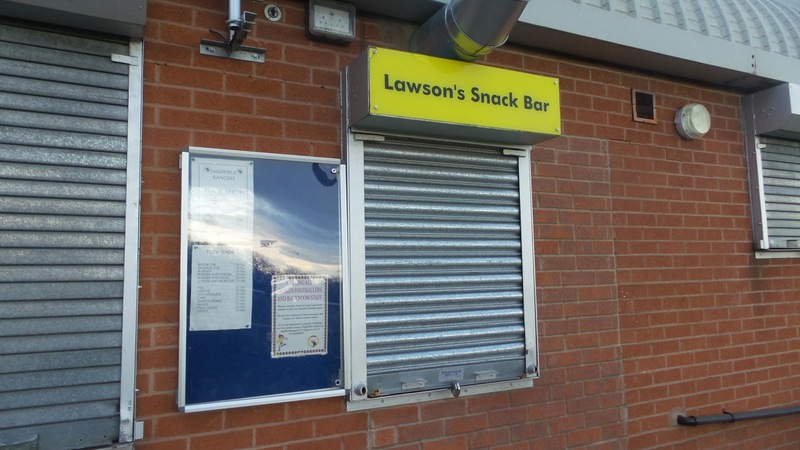 We went in the clubhouse and found out that they failed ground grading as the capacity of the ground was only 900, though to be honest it wasn't much worse than Petersfield or Salford City at steps 4 & 3 respectively apart from the lack of turnstiles. Pre match I bumped into the referee who I follow on Twitter and was also the linesman when we went to Stamford earlier this year and so we had a brief chat. 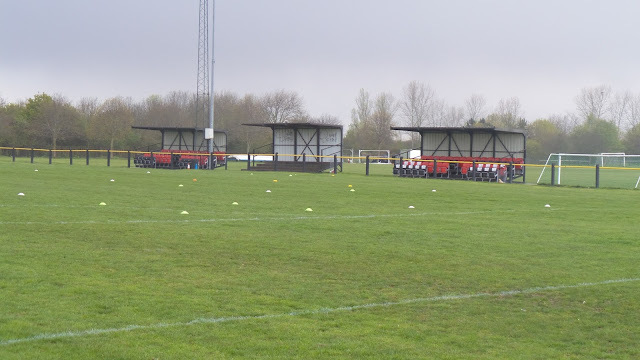 It was unseasonably chilly, despite being nearly May the temperature at half time was 3 degrees. Despite Holbeach starting slightly the better side it was the hosts who had the first real chance of the game. 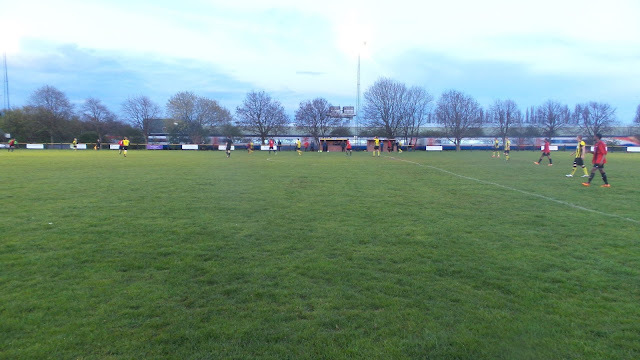 The last man was brought down and the offender red carded but the resulting penalty was screwed wide. Nirvana took the lead on 20 minutes with a Matthew Melbourne shot from around 10 yards that hit the underside of the bar on it's way in. 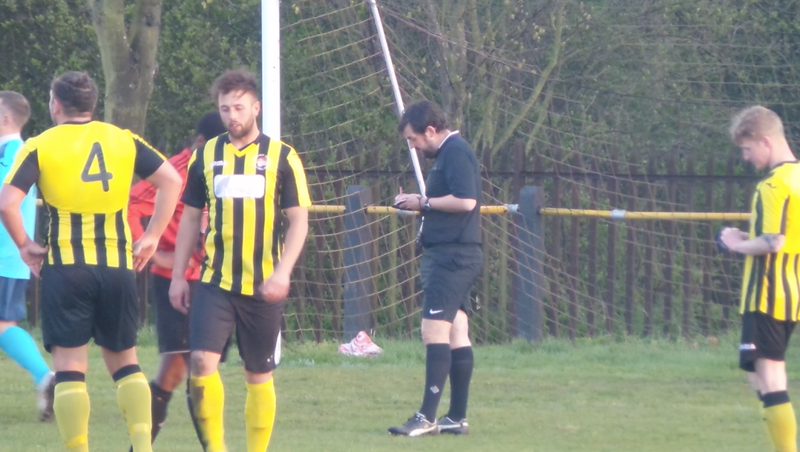 This signalled a period where the hosts seized the initiative and Holbeach did not help their cause by having another man sent off for denying a clear-cut goalscoring opportunity. 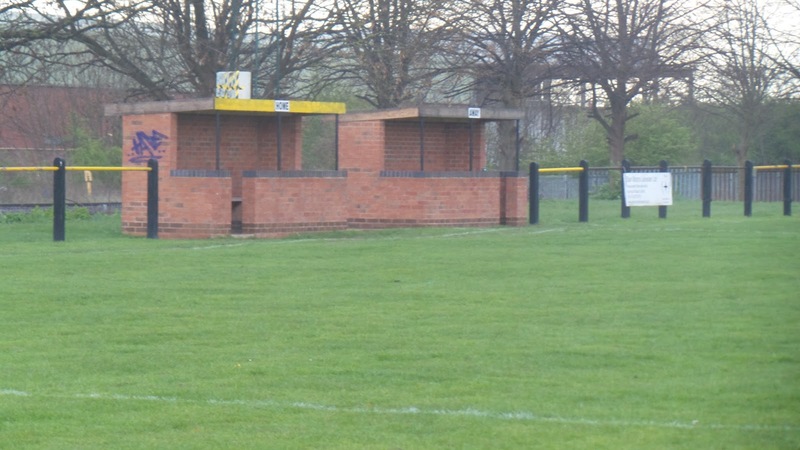 Nirvana doubled their lead just before half-time when a cross from the right by Master deceived the keeper and went straight in. 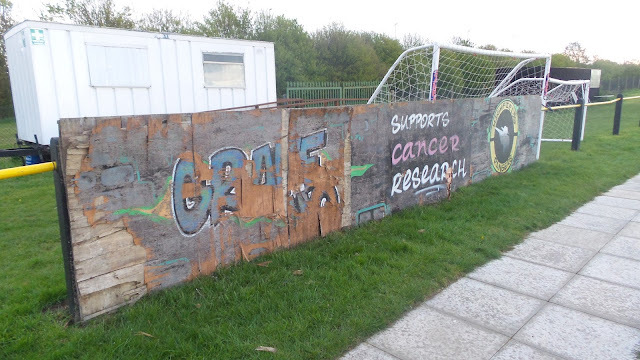 On 53 minutes it was 3 with the goal of the night when a mazy run was capped by a superb finish for Reece Morris. It was 4-0 on 56 minutes when Master got his second with a shot through a crowd of players. Melbourne got his brace on 70 minutes as he got away from the Holbeach defence and slotted past the keeper. 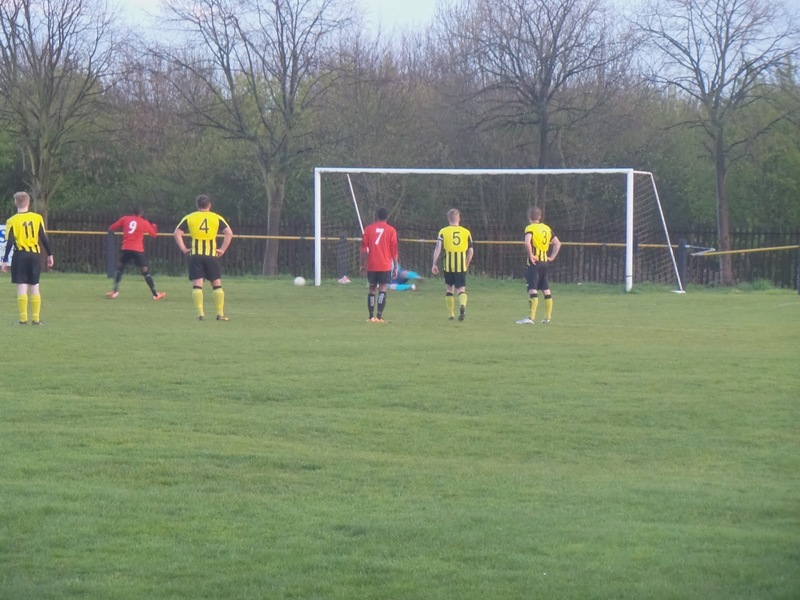 It was six after a good cross found Jordan Nelson and he curled a shot in the bottom right hand corner. 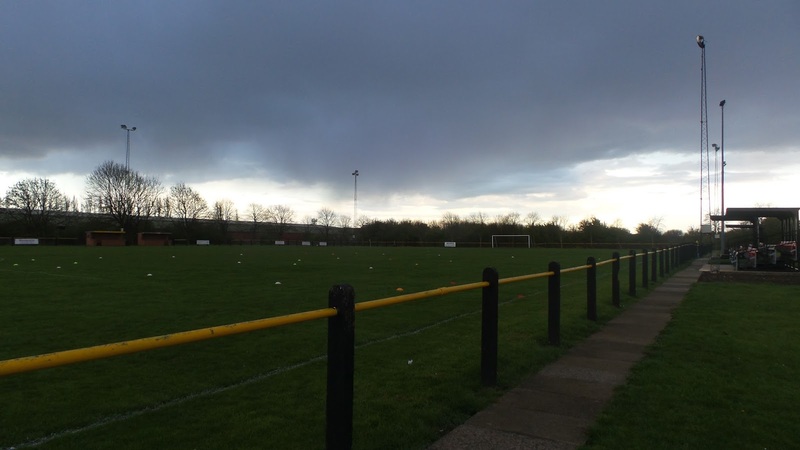 Finally on 88 minutes the rout was complete, this time through Matthew Melbourne who capped a great performance with his hat trick. 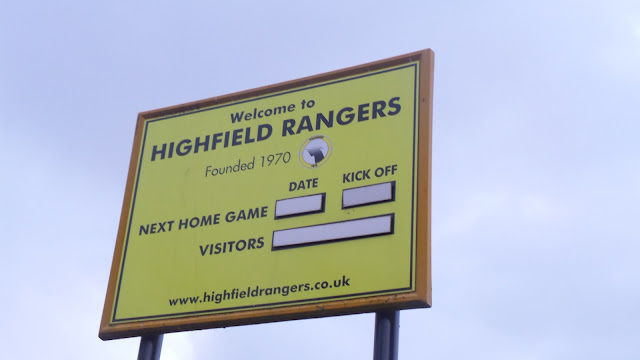 The drive home was pretty good, though it wasn't until nearly 10 that we got away due to the 8pm kick off. We listened to the football analysis as Manchester City drew 0-0 at home to Real Madrid in the Champions League. I was a bit disappointed for my mate Louis who's Hythe team got to the playoff semi-final in the Isthmian Division 1 South only to be thumped 7-0 at Worthing, the same score as the game I'd seen. 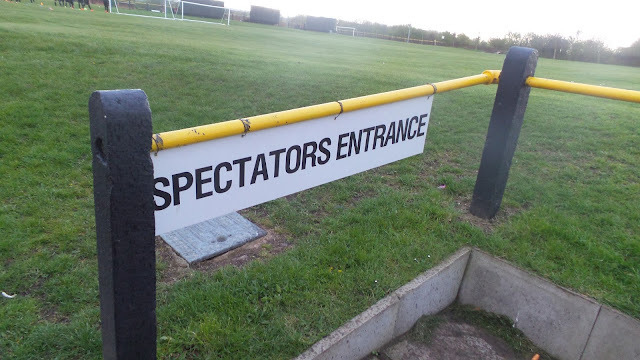 Related to tonight's game Nirvana's closest rivals AFC Kempston Rovers had 'only' beaten Eynesbury Rovers 3-0 so that gave a clear advantage on goal difference. For the rest of the journey, there was more about Hillsborough, especially The Sun newspaper who has printed those offensive lies so boldly on their front page all those years ago. Yet there was no mention of the inquiry on the front page with the story relegated to pages 8 and 9 of tomorrow's paper. I dropped Anwar off at 11.25, getting home myself 20 minutes later. I watched TV for a bit before going to sleep around 1am. GLENEAGLES AVENUE is actually the home of Leicestershire Senior League outfit Highfield Rangers. 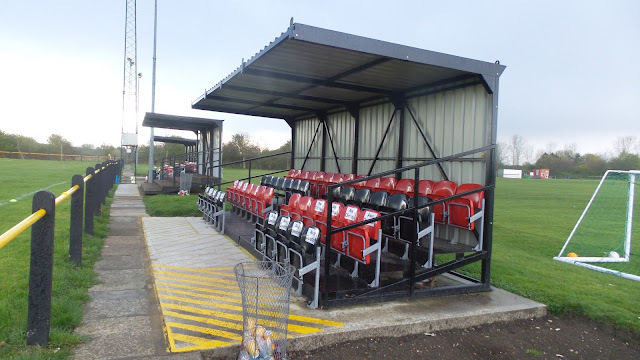 It's an excellent ground for that level and a reasonable one for step 5 with 3 metal stands - 2 seated holding just over 100 and a standing area holding around the same. The rest is hard standing. 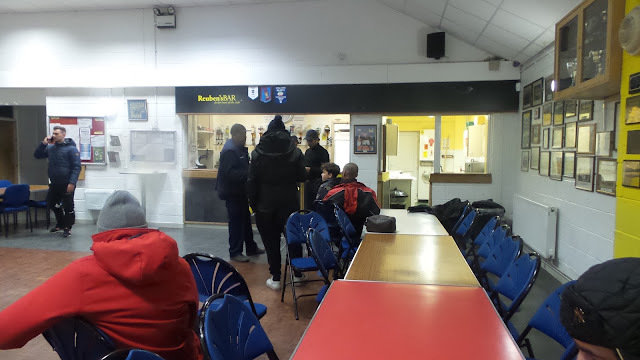 The clubhouse offers a basic range of drinks while the tea bar offers burgers, bacon rolls and hot dogs but wasn't open when I visited. 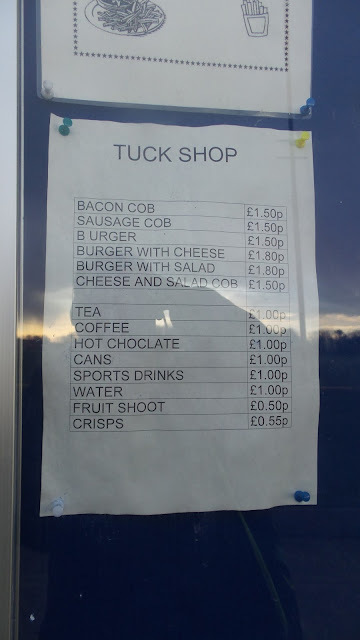 The ground is in the middle of a housing estate and there wasn't much around that I could see, so you are probably best off eating en-route.